Most of the businessmen and career minded people wishes to become millionaire overnight. This will only happen if they are visited by the Five Gods of Wealth. The five Gods of Wealth are Military God of Wealth, Rich God of Wealth, Civil God of Wealth, Righteous God of Wealth and God of Windfall. They play different roles in handling financial matters and blesses people in different manners to accomplish riches. This Wealthpot has the image of all the Five Gods of Wealth on the belly of the pot and is called "Earning Large Quantity of Gold Each Day". There are also two dragons on the side to bring one with solid business luck. This item is specially catered for those who have higher ambitions of making more money in an incremental manner and would like to leapfrog higher and higher to gain more material success. Gold ingots, coins, the Ru Yi for authority, a pair of Deers Horn for longevity and a pair of Rhinoceros Horn (one of Eight Treasures) for happiness fills the pot to potently attract in prosperity and abundance. You may place this at your home's wealth corners or the cash register of your shop or on the desk of your office. 1. 3-Coins to generate trinity of heaven-earth-mankind. 2. Rock salt to remove negativities and evil intention. 3. 7 Treasures Gem Chips to represent precious jewellery. 4. 5 Element Strings to represent balance in 5 Elements and having sufficient clothings to wear. What Wealth Pot symbolizes and how to place the object? Wealth pots depicting treasures overflowing with gold ingots is extremely auspicious to accumulate abundance of wealth in your business premises and homes. In Asia, nearly all successful shops will have this powerful symbol at their reception or cashiers to attract in prosperity luck and lots of fortune. They are also often seen placed near Wealth Gods such as Tua Peh Kong or Chai ShenYeh. Also display this wonderful energizer of prosperity luck on your desk to attract lots of wealth and good fortune into your office. 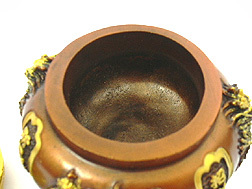 Good wealth pots must look as if they are overflowing to ensure you will enjoy abundant wealth in life. 1. Military God of Wealth: Military God of Wealth (General Zhao Kong Ming) gives powerful blessing of good fortune for those doing businesses and taking them seriously. Zhao Kong Ming was once a famous general in ancient China. Knowing that he is a righteous, honest and just man, the heaven's Jade Emperor bestowed him the role of distributing earthly wealth and assisting the earthly man to chase back any bad debts. Hence he is often prayed for abundance, prosperity and wealth luck for careers, sales and businesses. For those in business, his presence will ensure all bad debts to be returned without much trouble. 2. Rich God of Wealth: This is the most popular God of Wealth. He was a rich man called Shen Wan San, a Finance Minister at the beginning of Ming Dynasty. Legend has it that he possessed Wealthpot that could keep on producing money and jewellery which is why now wealthpots become so important in Feng Shui. Zhu Yuan Zhang sought his help when the former wanted to build up the Ming Dynasty and was short of capital. The Heavenly God later conferred him the title, God of Wealth-Creation. His left hand holds a Ru Yi while his right hand holds the Wealth-generating Pot. He blesses those who are involved in business, stocks and banking. 3. Civil God of Wealth: Bi Gan was a faithful official of the Shang Dynasty. To prove his loyalty, he presented his heart to Emperor Zhou. The Heavenly God, knowing that Bi Gan was loyal and would be impartial as he had no heart, bestowed the title of the God of Wealth upon him. As he was the first person to be conferred, he is also known as the True God of Wealth. 4. Righteous God of Wealth: Guang Yun Chang was a righteous man, he is well respected by businessmen as trust is important in the business world. He blesses one who is seeking for honesty in their business dealings and to hope their business partners are reliable as well. As he creates wealth through his righteous acts, he is known as the Righteous God of Wealth. 5. God of Windfall: Also known as God of Earth or Tua Peh Kong. He has five subordinates known as Gods of Wealth of Five Zones who are stationed at the East, South, West, North and Central zones. In order to have control over all the districts, the God of Windfall will help anyone whether he is good, evil, rich or poor, to manage his wealth so that it won't deplete easily. Five Gods of Wealth, Civil God of Wealth, Military God of Wealth and Rich God of Wealth are gods belonging to heaven while Tua Peh Kong is a god of the earth. Whilst the heavenly gods distribute the wealth to individuals, he is the one controlling and passing it on to each individual. 1. 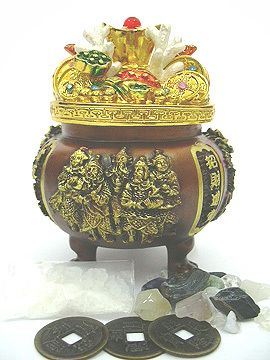 Display the wealth pot in your living or family rooms, business premises and offices, especially in southeast corner (wealth corner) to activate and enhance your wealth luck. 2. Display the wealth pot facing your entrance so that you can see it as you enter to invite wealth and multiple fortune luck into your homes at chi entry points. 3. Display the wealth pot in your office and shops to ring in more sales and achieve more monetary gains and successes. 4. Display the wealth pot in the Northwest sector to activate your financial support luck for money finding opportunities. 5. The wealth pot image is a must for Tycoons and for those doing any kind of business seeking for success. The symbols sends vibes to our minds to remind us of money seeking opportunities. Note: Do not place wealth pots on the floor, toilets and kitchen.